Q: Who is the ISCB? A: ISCB or the International Society for Computational Biology (http://www.iscb.org/) is the parent organization and primary sponsor of the annual ISMB conferences. The ISCB is dedicated to advancing the scientific understanding of living systems through computation, with a special emphasis on the role of computing and informatics in advancing molecular biology. The Society aims to serve its membership by facilitating scientific communication and raising awareness through meetings, tutorials, publications and by electronic means. ISCB membership offers many benefits including reduced conference registration fees and reduced subscription prices for the Journal of Computaional Biology and Bioinformatics Bioinformatics is the official journal of the society. There are currently over 1200 active members (year 2000 - 2001) from 42 countries including more than 300 students and trainee members. A member's meeting and a meeting of the Board of Directors for the society are held annually in conjunction with the Intelligent Systems for Molecular Biology (ISMB) conference. Officers are elected on an annual basis and serve voluntarily. A: ISMB (Intelligent Systems for Molecular Biology) is an international conference sponsored by the International Society for Computational Biology. Over the past ten years, the ISMB conference has grown to become the largest bioinformatics conference in the world. For 2002, more than 1800 delegates from nearly 40 countries are expected to attend. ISMB conferences provide a multidisciplinary forum for disseminating the latest developments in bioinformatics. ISMB brings together scientists from computer science, molecular biology, mathematics, and statistics. Its principal focus is on the development and application of advanced computational methods for biological problems. A: Edmonton is located in Western Canada, in the province of Alberta. It is about 600 km (360 miles) north of the US border and about 1000 km (650 miles) away from the Pacific ocean. Edmonton is about 350 km (200 miles) away from the Canadian Rocky Mountains. Q: What language is spoken in Edmonton? A: English. Edmonton is actually Canada's most multicultural city and has active cultural and linguistic groups from more than 90 countries. French, Chinese (Cantonese and Mandarin), German, Hindi and Ukranian are the most commonly spoken "second" languages. Q: Do I need vaccinations to visit Canada? Q: Do I need my passport to visit Canada? A: Valid Passports are required for all visitors who are not residents of the USA or Canada. Visitors from the USA must provide a birth certificate and a photo ID or � better yet -- a passport. Q: How much is a Canadian dollar? A: The Canadian Dollar is roughly valued at 2/3 of an American Dollar. More precisely: $Cdn 1.00 ~ $US 0.65. The following currency converter will allow you to convert Canadian dollars to other currencies. Q: How much do things cost in Edmonton? A: Edmonton is very inexpensive. Big Macs cost US$1.99. High quality restaurant meals are generally priced between US$8 and US$15 per person. Luxury hotels are typically priced at US$80~US$100 per night. Public transportation (downtown LRT only) is free from 9:30am to 3:00pm on weekdays. The costs of most other goods (clothing, electronic items, books etc.) are similar to most Mid-west US cities or about 2/3 the cost of most European cities. A: The Edmonton International Airport is located about 35 km directly south of Downtown Edmonton (where the conference is to be held). You may take a cab, limousine, bus or you can rent a car. Details about how much these options cost can be found here. A: Registration (badge and conference material pick-up) will take place at the "Assembly Level" (see picture) of the Shaw Conference Centre, in front of Halls A and B. 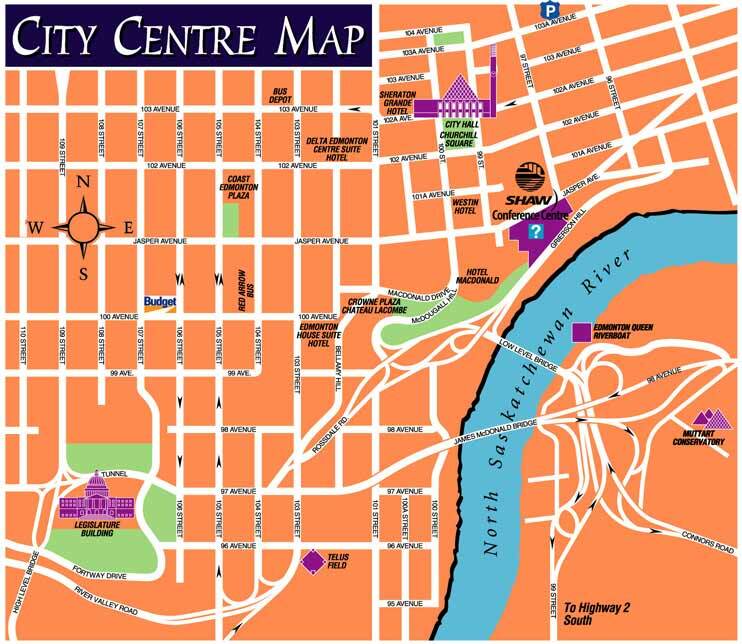 The following map shows where the Conference Centre is located in downtown Edmonton. Early registration (prior to Aug. 2) can be completed at the Westin Hotel in the hotel lobby. Conference attendees may start to register at the Shaw Conference Centre on the morning of Aug. 3 (7:30 am). The registration booth will be open all day Aug. 3 and 4. Registration will continue until Aug. 6. Q: Which expenses does a Travel Fellowship cover? A: Travel Fellowships cover registration fees, air fare, tutorial fees, accommodation, and meals. The award varies according to region of origin. The maximum amount of money allocated to each fellowship is $US650 for residents of Alberta; $US1000 for residents in other areas of Canada and $US 1500 for all participants outside Canada. Undergraduate students, graduate students and post-doctoral fellows are eligible for travel fellowships. In some cases, students and PDFs may request and receive registration fee waivers. Q: Where do exhibitors go to set up their booths? A: Exhibitors must register at the conference registration desk (see above) prior to setting up their exhibits. Exhibitors should show up on or before Aug. 2, 2002. Aug. 3 will be devoted to exhibitor set-up. An individual or individuals at the conference will assist exhibitors with their exhibit assembly. Special audio, visual or internet requirements for exhibitors should be worked out with the conference organizers prior to arrival. Exhibitors must clear and disassemble their exhibits/booths by 21:00 on Wednesday, Aug. 7. Q: Where do I set up my poster? A: Conference attendees who are presenting posters will be assigned poster board locations within Halls A & B (see map) at the time of registration and badge pick-up. Posters must be placed at the assigned location prior to the first poster session (17:00 on Sunday, Aug. 4). Posters must be removed by 19:00 on Wednesday, Aug. 7. Q: Who do I see to set up my podium presentation? A: Keynote speakers and paper presenters are required to provide an electronic copy (CD, floppy disk, Zip disk) of their presentation or a set of 35 mm slides to the Audio-Visual technician (located at a booth on the East side of the Hall C entrance) at least 2 hours prior to their presentation. To avoid unforeseen technical failures, we STRONGLY ENCOURAGE presenters to use MS PowerPoint or Lotus Notes for their electronic presentations. Special requirements (video, live demo's, web connectivity, etc.) should be worked out with the AV staff 24 hours prior to your scheduled presentation. Q: What is the Cyber Cafe? A: The Cyber Cafe is an industry sponsored facility offering web and e-mail access to conference attendees. This year's Cyber Cafe will have 40 laptops linked to high-speed cable modems. It is sponsored by Canadian Bioinformatics Workshop. To avoid long lines, we recommend that users limit their access times to 15 minutes per session. Q: Where is the Cyber Cafe? A: The Cyber Cafe is located on the south side of the Exhibition and Poster halls (Halls A & B) shown here. Q: What do I do if I lose something? A: ISMB 2002 will operate a lost and found centre, information centre and coat/bag check facility at the west side of the Assembly level (near the escalators). Q: How much does ISMB 2002 registration cost? A: Conference registration including conference badge, conference proceedings, on-site breakfast and lunch, reception tickets, drink tickets and industry night reception costs US$300 ~ US$715. Tutorials (on Aug. 3) are US$85 each. The registration fees do not cover hotel or travel costs, nor do they cover dinners. Q: What is the GST? A: The GST (Goods and Services Tax) is a value-added (7%) tax levied by the federal government on almost all items (except groceries) purchased in Canada. Visitors from outside Canada can apply for a GST refund by keeping your receipts and submitting the the form (which you can pick up at conference site or at Canada Place) with them at the airport just before you leave. Refunds take about 6 weeks to be processed. Q: Where's a good place to eat? A: Many of the downtown hotels that registrants will be staying at offer excellent menus. One of Edmonton's top restaurants, called the Hardware Grill is located just a few hundred feet from the Shaw Centre entrance. Other places to eat include Sorrentino's (10162 100st) and the Japanese Village (10126 100st). A list of some of Edmonton's finer restaurants along with their locations is provided here. Q: Can I get to the Canadian Rockies from Edmonton? A: Edmonton is located about 3-4 hours (by car or bus) from the Canadian Rockies. These are home to the world famous National parks, Jasper and Banff, both of which house World Heritage sites. The parks can be quite busy in the summer (especially on weekends). Greyhound and Red Arrow bus lines offer regular bus service to Banff and Jasper. Alberta is also home to some of the world's richest deposits of Cretaceous dinosaur fossils near Drumheller (about 2.5 hours from Edmonton) and Dinosaur Provincial Park (about 3.5 hours from Edmonton).